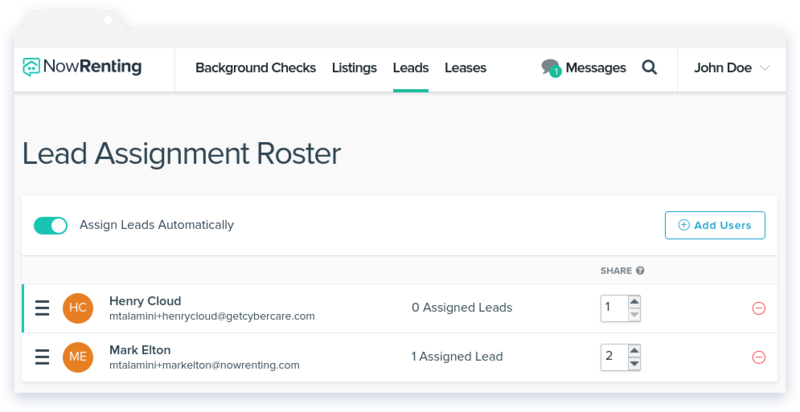 NowRenting’s Lead Assignment Roster lets you set up automatic lead assignment. 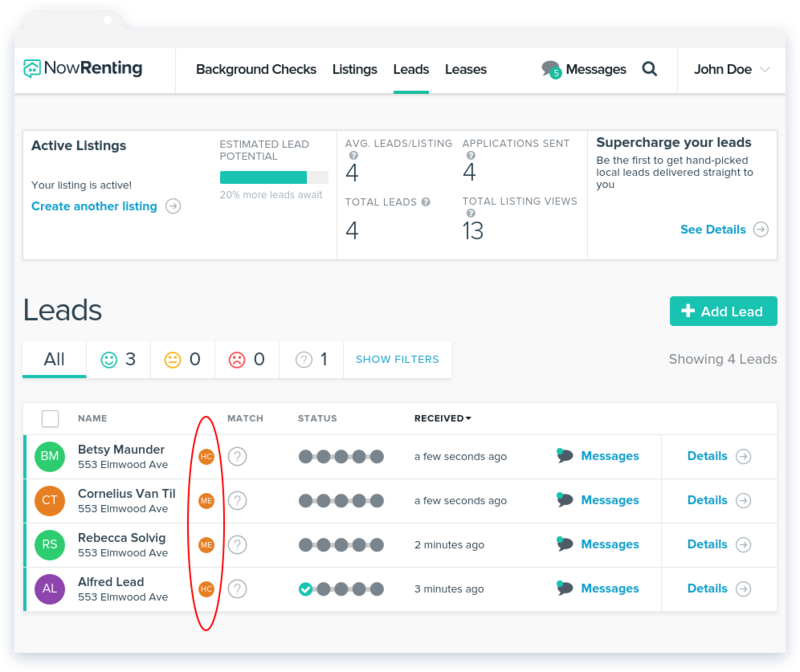 Your team will have leads assigned to them automatically, as they come in. If you haven’t given your team user accounts on NowRenting yet, see here for instructions. To access the Lead Assignment Roster, click Leads in the top navigation bar, and then Assignment Roster in the dropdown menu. 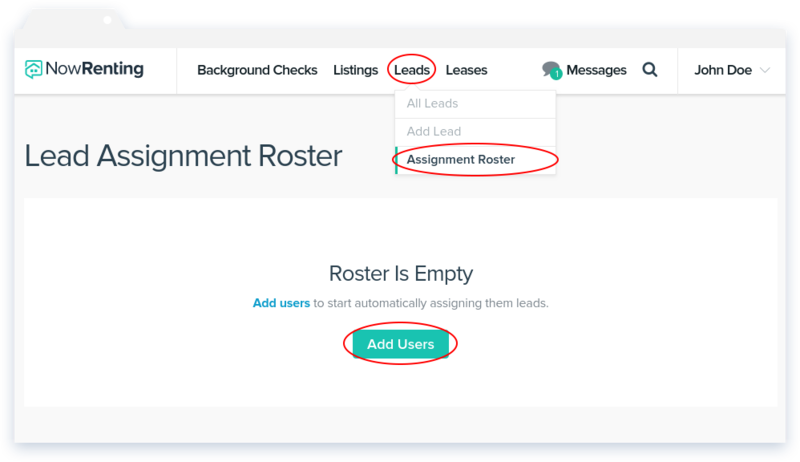 To set up automatic Lead assignment, first you have to add users to the roster. Do this by clicking Add Users. You’ll see a window with a list of your users. Select the ones you want to add to the roster and click the Add Member button. If you don’t see the user you’re looking for, you can type their name into the search bar at the top of the window. Use the Assign Leads Automatically toggle to turn automatic Lead assignment on and off. Click and Drag a user’s row to change their order in the roster. 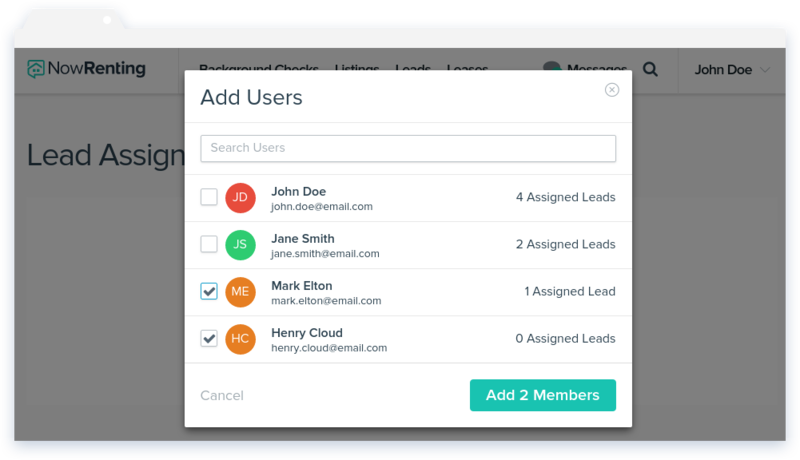 The control in the Share column allows you to set how many Leads a user will receive during each round. The minus icon lets you remove a user from the roster. The user highest on the list will get the first new Lead that comes in. They’ll get as many new Leads as the number in the Share column, and then the next new Lead will go to the next on the roster. For example: In the screenshot shown above, Henry will get the first new Lead, then Mark, then Mark, and then Henry again, and so on. Mark gets two Leads in a row because his Share number is set to 2.